Former Top Chef contestant, San Diego resident, and chef Brian Malarkey and his partner James Brennan are set to open their first restaurant in Los Angeles on January 17. It’s the second outlet of the pair’s popular Herringbone concept, located inside the swanky Mondrian Hotel on the Sunset Strip. The former Asia de Cuba space has been transformed into a breezy oasis by Schoos Design. Large west-facing windows brighten the space, and allow for a dizzying view of the city below. Gilded fish bone accents and white marble table tops give the interior a warm glow, while gritty, food-related art keeps the interior edgy enough for the Strip. There’s a long bar both inside and out, and a total of 220 seats, including those in a lounge-like setting near the pool. Malarkey has installed chef de cuisine Anthony Sinsay in Herringbone L.A.’s kitchen. Sinsay is responsible for breakfast, lunch, dinner, and in-room dining for the hotel. 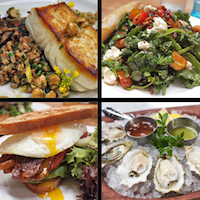 The menu, while taken from Herringbone’s San Diego location, does offer a few new dishes. In addition to oysters, crudo, salads, and clam chowder, there’s a small plate called carne asada fries “SD in LA.” Pizzas and larger plates emphasize the surf and turf theme: Clams and bone marrow top a wood-fired pie; seared Diver scallops are served with crispy sweetbreads; an 8-ounce filet comes with King crab and “beefy” bernaise. Balanced on the edge of the steak house-meets-fish shack concept are desserts like passion fruit cheesecake and a rocky road chocolate cake. This morning, Brennan’s Enlightened Hospitality Group announced that Hakkasan Ltd. had taken a majority ownership in their company. The partnership is playing an enormous role in the growth of EHGRP. “We didn’t think we were going to be talking about international expansion for many, many years,” says Brennan, “but it’s all happening very fast.” Next up for L.A. is a location of the group’s Searsucker concept. “I feel like we’re ready for anything now, and I think L.A. is going to be shocked, if not pleasantly surprised about what we have to offer,” says Brennan of Herringbone L.A.
Herringbone L.A. opens to the public this Friday, January 17 for dinner. Herringbone L.A. at the Mondrian Hotel, 8440 W. Sunset Blvd., West Hollywood, 323-848-6000 or morganshotelgroup.com.